Atlas ERP is a web-based business automation platform that works 24/7 nonstop to help you carry out and streamline your business functions to improve productivity and maximize your business efficiency. User-friendly and cost-effective, Atlas ERP works well for all business types and sizes. The software makes creating and implementing business processes effortless. It is an ideal tool for managing projects as well as preparing analytics and performing financial accounting tasks. This robust business enterprise resource planning system lets you stay on top of your finances, sales, projects, communication, and logistics. Atlas ERP effectively unifies all your business processes, making them more manageable and accessible. Atlas ERP is a cost-effective enterprise resource planning (ERP) system designed by entrepreneurs for entrepreneurs. This intuitive and straightforward business solution streamlines your business tasks and functions, from managing your processes, handling your clients and orders, and overseeing your production and sales. As every workflow becomes more fluid, manageable, and transparent, Atlas ERP is one comprehensive solution that takes your enterprise to higher heights. Serving businesses with a modular approach, you can take control over every aspect of your company. With the Trade module, business processes such as taking orders, billing, and settlements is a breeze. You can easily generate financial reports based on reliable data and can be tailored to show you the details you want. With its Internet Marketing module, Atlas ERP makes it easy for your business to improve its online presence and extend its reach to clients and prospective customers in the online world. Atlas ERP turns your business website into a well-oiled marketing machine. Smooth and frictionless integrations with Facebook, MailChimp, Google Analytics, eBay, and Shopify enable you to fully maximize your online marketing potential. Atlas ERP grants you full control over your KPIs. Tracking projects is a breeze as well, thanks to its core project management capabilities that include SCRUM, Gantt charts, and more. 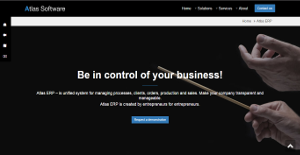 Atlas ERP comes with business process management capabilities, enabling you to create and execute your own workflows. CRM module lets you automate your sales, improve sales performance, and implement better ways to engage and retain your customers. Every company has different requirements and requires a software that can be customized for their size, kind of employees and customers, and the specific industry they are in. For these reasons, no software can provide perfect functionality off-the-shelf. When you look for a software system, first be sure what you require it for. Read some Atlas ERP reviews and ask yourself do you desire basic features or do you want sophisticated features? Are there any industry-specific features that you are looking for? Get the answers to these questions to help your search. There are multiple aspects that you need to reflect on and these include your budget, particular business requirements, your company size, integration requirements etc. Take your time, try out a few free trials, and finally choose the system that provides all that you require to improve your firm efficiency and productivity. How Much Does Atlas ERP Cost? We realize that when you make a decision to buy ERP Software it’s important not only to see how experts evaluate it in their reviews, but also to find out if the real people and companies that buy it are actually satisfied with the product. That’s why we’ve created our behavior-based Customer Satisfaction Algorithm™ that gathers customer reviews, comments and Atlas ERP reviews across a wide range of social media sites. The data is then presented in an easy to digest form showing how many people had positive and negative experience with Atlas ERP. With that information at hand you should be equipped to make an informed buying decision that you won’t regret. What are Atlas ERP pricing details? What integrations are available for Atlas ERP? If you need more information about Atlas ERP or you simply have a question let us know what you need and we’ll forward your request directly to the vendor.